The city provides assistance for city residents and business owners who have sewer back-up problems. 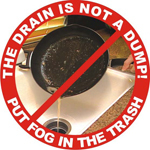 DPW will provide flushing and plunging services to outside vents and cellar drains. If these services cannot eliminate the back-up or if they provide only temporary relief, residents and business owners must then enlist the services of a plumber. If you have a sewer back-up you should call 448-CITY (2489). Maintenance of sewer vent pipes and caps (usually located in the front of the house, near the street) is the responsibility of the homeowner. Sewer vent caps often become broken or missing. Caps can be obtained at most hardware stores (True Value) and home improvement stores (Home Depot). The city maintains all the street drainage basins (catch basins) within the City of Syracuse. These drainage basins sometimes become filled with leaves or debris that inhibit the drainage effectiveness. To report the location of a catch basin that needs cleaning or repair, call 448-CITY (2489). No. 1 cause of sewer backups in homes! Click here for a fact sheet on the proper disposal of F.O.G.